Delicate as a butterfly's wings! 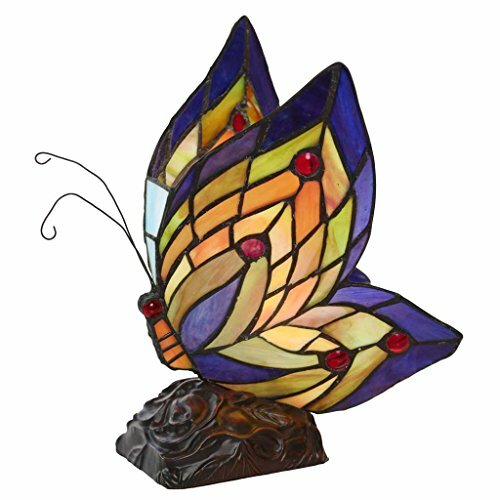 This colorful butterfly accent lamp brings joy and light to any décor with its 100 pieces of hand cut glass and 10 cabochons. Brilliant shades of purple, green, and red radiate along the wings. The butterfly sits perched on an base decorated with roses colored an antique brass. Use as an accent piece, a buffet lamp, a child's nightlight, the possibilities are endless! If you have any questions about this product by River of Goods, contact us by completing and submitting the form below. If you are looking for a specif part number, please include it with your message.